Just when we thought that we’ve tried all the Japanese spots in Singapore, more seem to pop up every month! If Telok Ayer is your usual haunt, it’s time to add another sushiya to your list. Cue Rizu Modern Japanese Cuisine, the latest addition to the slew of hangouts at Duxton Hill that is sure to give the other eateries a run for their money. If you’re looking for a quiet space to enjoy an exquisite Japanese spread, look no further than this quaint sushiya. The ambience is rather dim, which may not be ideal if you’re trying to take snapshots of the gorgeous interiors and dishes. However, rest assured that the experience here will make up for it! Choose a seat al fresco to soak in the ambiance along Duxton Hill, or take a table indoors and delight in the deep blue interiors of the restaurant. The service is attentive but not ostentatious, and the waiting staff is always ready to answer any queries about the menu items. Attention to detail is impeccable here; from the food down to the tableware, small meaningful details are added to give Rizu that extra personal touch! 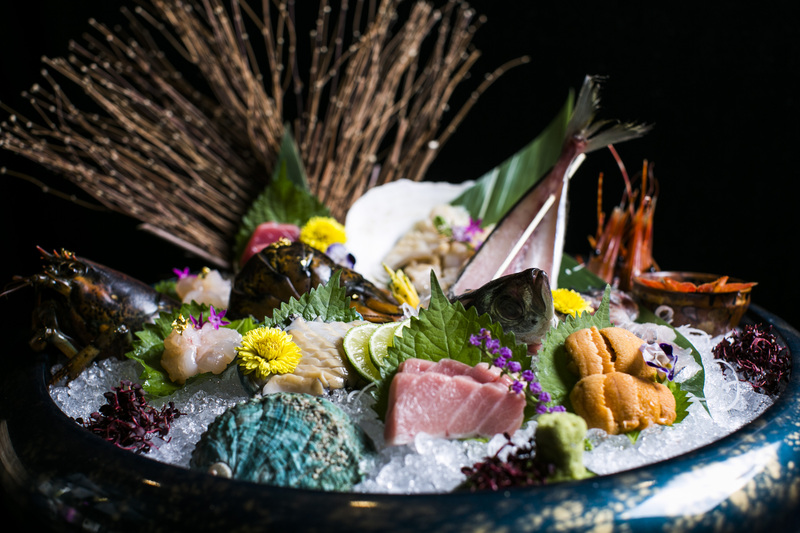 The best way to have a taste of Chef Noboru Shimohigashi’s culinary ingenuity is through Rizu’s Special Omakase, comprised of 11 specially-prepared dishes using the freshest ingredients of the day. Bringing diners through a journey of flavours, Chef Noboru brings diners on an experience to remember. When this massive platter hits the table, you’ll be mesmerised by the assortment of fresh sashimi on display. This spread features a worldly catch from some of the best fishing sites across the globe, from the cool waters of Boston and Norway to the Eastern seas of Japan and Korea. Need a testament to its freshness? Pay close attention to the ‘decorative’ lobster head – if you’re lucky enough, you’ll catch it moving from time to time! Unlike the creamy European version, the seafood bique at Rizu is a lighter version that’s pleasing to the palate and heartwarming at the same time. Packed with flavours of the ocean, the lobster bisque is extremely satisfying and the chunks of lobster meat add texture to the smooth, delicious broth. Chef Noboru’s ingenious way of pairing the buttery foie gras with the figs, plum sauce, and ume flesh makes this seemingly simple dish stand out on its own. The refreshing tartness of the fruits cut through the savoury foie gras – it’s undeniably a match made in heaven. Indulgence seems to be a recurring theme in Rizu’s omakase but we’re not complaining! One good example is Chef Noboru’s Wagyu Steak with Special Wasabi Sauce. Tender and beautifully marbled steak slices are seared to perfection, served with a side of seasonal vegetables. For those weary of wasabi, you can take comfort in knowing that the sauce tastes more like earthy sesame sauce dressing. Fans of sukiyaki will adore this dish. Savoury and slightly sweet, the beef slices are cooked extremely tender with a melt-in-your-mouth consistency. The flavours lean towards the stronger side, but with the light miso soup, it comes together beautifully. The golden, runny onsen egg gives the rice extra depth that amps up the lux factor. To cleanse the palate, treat yourself to the Crumble, Pear Gelee and Pear with Vanilla Ice Cream. For those watching your waistlines, this light dessert is the perfect way to round up a meal. It’s not extremely sweet, which makes it a perfect dishes for those who aren’t too fond sweetness.